We’re very excited to introduce you to ProDemand Mobile, our latest enhancement to the product that allows you to access our comprehensive repair information just about anywhere you work on vehicles. The even better news is that effective immediately, we’re including ProDemand Mobile with your ProDemand subscription at no additional charge. 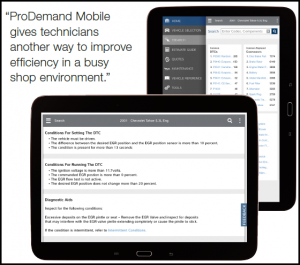 ProDemand Mobile is optimized specifically for tablets*, making it easy to retrieve and view the repair information content right at the vehicle, or anywhere ProDemand is needed. You’ll find all the features you expect from a mobile device — like swipe, scroll, drag and pinch touchscreen gestures. Just log in to ProDemand from your tablet (either Android or Apple) and you’ll have all the mobile functionality right at your fingertips. ProDemand Mobile does not include the Component Search, Vehicle Reference, SureTrack and Vintage modules. ProDemand Mobile has a few new controls for navigation; see the screenshots below (click on thumbnails to expand the images to full size). After you’ve navigated to a module by clicking on the module from the main menu, the name of the active module you’re in will be highlighted in blue at the top. To return to the main menu, simply click that blue module button. For example, let’s select Quick Lookups from the main menu. The list shown below will open. To get back to the main module list, just click the blue Quick Lookups module button. You’ll go right back to where you started (the screenshot shown above). 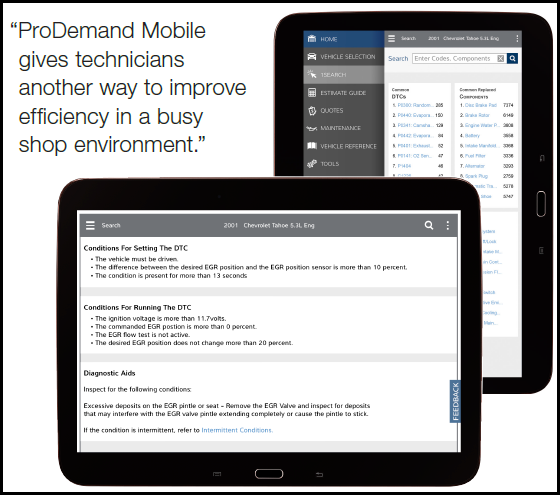 ProDemand Mobile is ready and waiting for you, so log in and give it a try on your tablet … and enjoy taking your repair information with you wherever you need it! For more information about ProDemand Mobile, read the blog post, Mitchell 1 Just Got More Mobile! *Best viewed on tablets with a seven-inch or larger screen. At this time, Windows Surface RT devices are not supported.